During 2014 the College began many new programs and initiatives that have established the College as a leader in entrepreneurship and innovation. You can read about these in prior issues of this newsletter. Read below about our MBA program being invited to compete in a case study challenge against MIT, Michigan State, and other leading universities from across the world (please support our team for the People’s Choice Award by clicking here.) 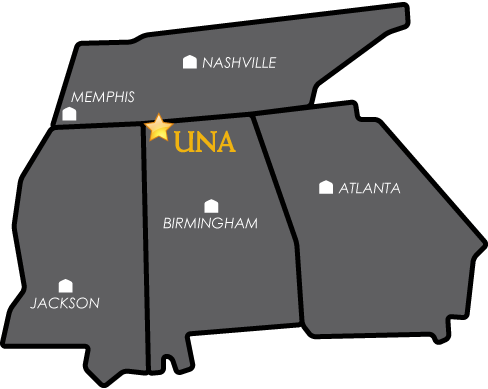 As our reputation for excellence continues to grow, the value of your UNA degree increases. Thank you for your support. On April 9, 2015 we will host a COB Awards Banquet. It is not too late to fund a scholarship for the banquet from your organization. Contact Johnette Davis (jdavis29@una.edu; (256) 765.5081) for more details. Your gifts to the COB are always appreciated. You can make a gift online.